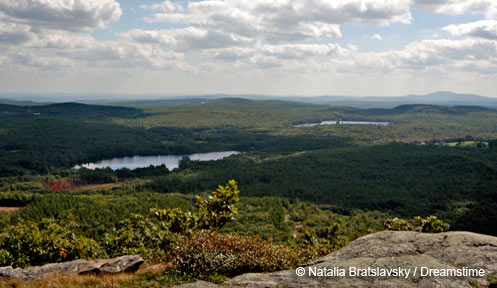 Acquisition History: The acquisition of Greenough Ponds was the fifth and final phase of the Androscoggin Headwaters Conservation Initiative that permanently conserved 31,377 acres owned by Plum Creek Maine Timberlands, LLC. The New Hampshire Fish and Game Department contributed $675,000 toward the Greenough Ponds purchase price of $2,475,000; the remainder of the funds were raised by the Trust for Public Lands through private donations and grants, including an additional $650,000 from the Land and Community Heritage Investment Fund (LCHIP). The property was conveyed to NHFG in 2013. Description: The property completely encompasses the undeveloped shorelines of the 234 acre Greenough Pond and the 42 acre Little Greenough Pond. A large forested/shrub wetland and open pond associated with Greenough Brook provides another habitat type surrounded by a northern hardwood and spruce-fir upland. Common Wildlife: The property provides significant habitat for moose, bear, ruffed grouse, American woodcock, beaver, mink, common loon, and the state threatened American Marten. The ponds are two of the last remaining wild trout ponds in the State. Directions: From Errol, take NH-16 North. In about 1.3 miles, turn left onto New Greenough Pond Rd. Drive approximately 1.2 miles until you see the NHFG sign. A small parking area and a trail provide access to Greenough Pond.